A convenient way to add banners’ sets. Interface is intuitive and visual, all you need is to upload and set your banners. The sets can be created in advance and switched on when you need it. Full management - titles, alts, redirect URLs, order of display. Ability to create plenty of campaigns. 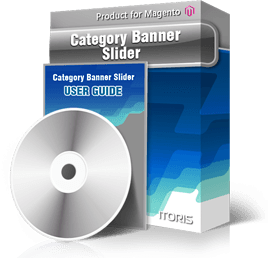 Each category of your website, each store can have a separate set of banners to be displayed - or share the same one. You can create as many sets as you need. Select pages you want the banners be displayed on. Home Page banners. This is a great place to display your most popular, most attractive or new products and services. Built-in design skins and auto-rotating. Several schemes for you to select - with auto-rotation or without it, with scrolling arrows, paging or titles. Flexible configuration. Manage the look of your banner campaigns in seconds - all is done for you already.